"These are quick, easy, vegan biscuits. I especially like them with soup or vegetarian chili." Stir together the whole wheat flour, all-purpose flour, baking powder, and salt. Combine the oil and soy milk in a measuring cup. Pour into the dry ingredients all at once, and stir just until the dough pulls away from the sides of the bowl. Drop by heaping spoonfuls onto a baking sheet. Bake for 8 to10 minutes in the preheated oven, until the biscuits are browned on the top and bottom. 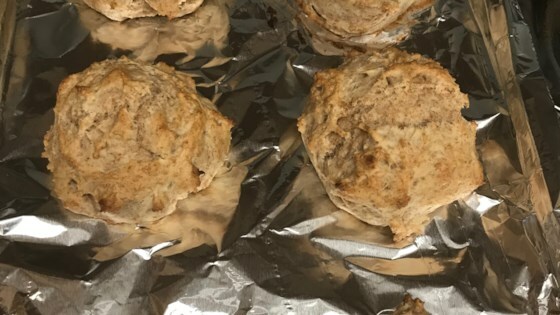 Use coconut oil and almond milk to create totally vegan biscuits. I didn't care for these. All I could taste was baking powder. Although they were easy, I won't be making them again. This was really good! I added a tablespoon of sugar and a touch more milk. just tastey! !